It might seem obvious, but one of the main reasons people use a calendar - any calendar - is to avoid double-booking and to make sure you keep your commitments. Customers love it if you show up when you say you're going to show up, just as you love it when your customers are home and their kitchens are ready for templates and installs. That sounds so simple, but if you want to meet your customer commitments consistently, there's a lot of coordination involved. JobTracker has several ways to help. For starters, make sure you set your work days and work hours correctly. It's also important to block out holidays (and other one-off non-workdays). Most of your scheduling will consist of Job Activities. If you want something to show up on the calendar that doesn't relate directly to a job, then use an Appointment. You can make as many calendar views as you need. Make sure to customize them as described above to separate out the people and resources you want to avoid overbooking. Remember that to avoid overbooking, you have to look at the appropriate calendar view before scheduling a new activity for an assignee! This is such an important step - looking at your calendar - that many fabricators hang TV's on the wall so that everyone can see key schedules all the time. 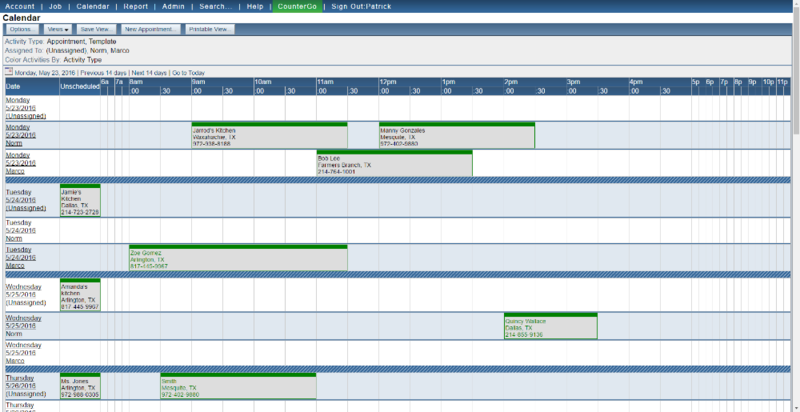 Many also find it useful for schedulers to have two monitors - one for looking at the calendar and one for scheduling activities. JobTracker won't restrict you from overbooking an assignee, but it does show warnings and other visual signals. You can also create dependencies on Job Activities to add additional warnings, but even then, a human has to use judgment to make sure all dependencies are met and to adjust things when they're not. Once you set up these dependency rules (like "Install should be scheduled after Template by at least 5 work days"), you can use auto-schedule to apply them and fill in some job dates automatically. This is a subtle but surprisingly important way of making sure you're not overbooking resources. For example, let's say you only really care about Template and Install, and you always fab the day before Install. You haven't been tracking Fabrication, because it seems like too much of a hassle, and it can clutter things up if you don't complete it (doing more harm than good). Let's say you frequently find yourself asking your shop manager, "hey is that Jones job ready to go?" That's a sign that you should be tracking Fabrication and having your shop manager complete each Fabrication activity when it's done. Use auto-schedule so that the Fabrication activity defaults to the day before Install (or whatever your business rule is), and then you won't have to ask about jobs that are already done, though you might still ask why certain jobs are not done. Over time, this will help you understand your shop's capacity better. That's one of the most common ways that fabricators get overbooked: by committing to more capacity than they can handle. The simplest way to address this thoroughly is to track your square feet on each job and then show the total square footage on your calendar. JobTracker doesn't impose a limit on those totals, so it's still possible to overbook! JobTracker provides you with information about the work flowing through your business, but you or your employees still have to review the calendar consistently as work comes in and make appropriate scheduling decisions (based on that information and your business approach). JobTracker doesn't have a magic formula for making sure that you never overbook ... but if you start following these steps, you'll eliminate more and more of the chaos in your calendar, you'll have fewer and fewer scheduling problems, and you just might feel like a magician yourself. Calendar View: How do I show one shop schedule broken out by Assignee? Calendar View: How do I show a daily schedule of Installs by Assignee? Calendar View: What activities does everyone have for the next week? Calendar View: How do I show a calendar for just one person?